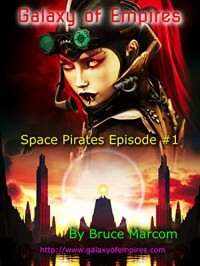 Galaxy of Empires (Space Pirates Episode #1) - Bruce Marcom - So many books, such little time. 'They all laugh as they order drinks from a wench passing by their table. They deal the cards and begin playing. After about an hour, a fight breaks out between two ruffians a few tables a way. A cup comes flying over to their table and hits Python on the head. Captain Meek and his band of space pirates travel around space purchasing a new space ship, new weapons and a cloaking device with platinum bars. When looking for hauling work they are summoned by Trent, the guild master, they are given the task to organise a meeting with Lady Evella Noctu of the Noctu Merchant Group who happens to be a Rainbow-Coloured Morphic Dragon with very powerful telepathic powers. Their mission to drop her and her daughter Gothica at Zertin, the home world on the Wolfkins. There were also simple words such as ‘the’ missing from sentences. And then later on there would be the same work repeated twice. Even in the quote used at the beginning of this review there is a mistake, ‘a way’ should be one word. There are the reason I am giving it only one star because I would be embarrassed to even let this be published without it being proofread.